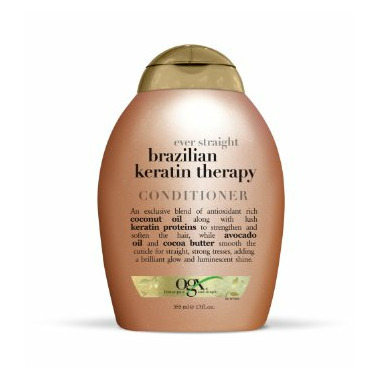 OGX Brazilian Keratin Therapy Conditioner contains an alluring blend of antioxidant rich coconut oil along with lush keratin proteins to strengthen and soften the hair, while avocado oil and cocoa butter smooth the cuticle for straight, strong, tresses, adding a brilliant glow and luminescent shine. This rich, sulfate free formula smooths and strengthens your curly or wavy tresses. Love it! Makes my curly hair straight if I blow dry it after using the shampoo+conditioner.